BANDA ACEH: The scenery from this hillside village is simply breathtaking with the sea in front and mountains behind. The air is cool and fresh and in the evenings you can watch a beautiful sun set into the sea. It is a view many tourists would pay money for. The nicest thing about it is that it is not for tourists or paying visitors but rather the new homes for the Dec 26, 2004 tsunami victims. The village was built from scratch. Before this, it was all just hills and trees. Then after the tragedy, Hong Kong superstar Jackie Chan came in to help and decided to build a village for the victims. 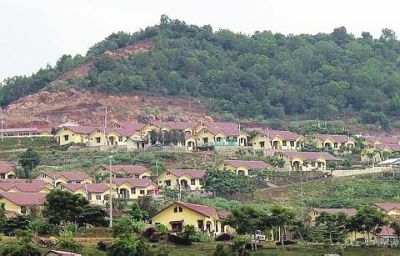 So while its official name is the Friendship Village of Indonesia-China, most people here refer to it as the “Jackie Chan village”. But some like Jin Sin, an Acehnese Chinese who lives in the village, thinks the action movie star had nothing to do with it. “Jackie Chan is from Hong Kong but this village is built by China, not Hong Kong. Jackie Chan’s donations did not come here. This is all from China,” said Jin Sin who admires both Jackie Chan and another action hero Jet Li equally. New landmark: One of the new buildings in Banda Aceh. Banda Aceh now looks fresh and new with lots of new buildings. A check from the Aceh authorities show that Jackie Chan did indeed build the village but they would not allow a village to be named after any individual, hence the name of the country. And, Hong Kong is after all part of China now. Ishak Ismail was renting a house when the tsunami struck and destroyed the home. So he is thrilled to come to the “Jackie Chan village” and be given a home to call his own here. He has planted roses and fruit trees in his garden. His son has bought a TV set and a DVD player although they still have no furniture and sit on mats on the floor. As happy as he is, he said, the disadvantage is the distance. “This village is 25 minutes away so if you don’t have transport it is difficult to get around,” he said. He also questioned the distribution of the homes after the tsunami, saying some people got two or three homes while others got none. At the Barak Bakoy, a barracks to house some tsunami victims temporarily, the co-ordinator, Idris Ismail, claims to have been at the barracks since February 2005 and says there are 173 families still waiting for new homes. 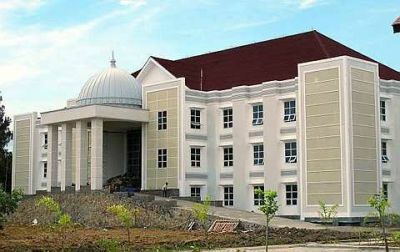 But Rahmat Thalib, who is an officer of the housing and infrastructure section of Aceh’s Reconstruction and Sustainability Agency, said 100% of the tsunami victims at the barracks had already moved into new homes. “Our problem is that we did not demolish the barracks straightaway and now we find that other people have moved in, claiming to be tsunami victims,” he said. “That is our dilemma now.” He said the victims had been given until mid-2008 to register themselves as victims and if they did not have land titles all they needed was a testimony from their village head or neighbours that they were indeed from the area. Rahmat lamented that after the numbers have been confirmed and re-confirmed countless times, mid-way through the construction, suddenly another few hundred people emerge claiming to also be from that area and wanting homes.